2013 looks set to be an interesting year for those of us residing in the Milky Way (page view stats indicate this applies to the majority of visitors to this blog). In the middle of this year, the supermassive black hole in the centre of our galaxy will be paid a visit by a cloud of gas with a mass three times that of the Earth. This could result in a bright flare of X-rays if some of this gas falls too near the black hole and is consumed, allowing us to probe the environment around it better than ever before. But how do we know there’s a black hole there in the first place, and why won’t this gas just get gobbled up without a trace? Sagittarius A*, the centre of our galaxy (click to enlarge). Credit: NASA/CXC/MIT/F.K. Baganoff et al. Despite being… well, black, black holes can be examined through their interactions with the local environment. They might not shine themselves†, but the gas they swirl and toss around and the stars which orbit them certainly can. It’s through these gravitational interactions that we can see the tell-tale signs of the dark monster lurking at the heart of our own galaxy. In the constellation of Sagittarius lies a region of X-ray emission, seen in the image on the right taken by Nasa’s Chandra X-ray observatory. The three colours in the image (red, yellow and blue) are separate images of different X-ray wavelengths, each snapped through an individual filter. Blue is the highest energy of the three and red the lowest. The white-ish cloud in the middle of the image appears white because it’s shining across the full range of energies, and within it lies the object known as Sagittarius A* (Sgr A*). Here it is in even higher energy X-rays, as seen by the fantastic new NuSTAR observatory, undergoing a flare in brightness. All this X-ray light is telling us something about the gas in that part of the galaxy; it’s very hot. In fact it can be heated up to around 100 million °C or more, which is about 6 times hotter than the core of the Sun! This gas could be a corona – a diffuse but hot plasma – surrounding the central object. Colder, more dense gas can be pulled in toward a black hole and, in the very closest region around the black hole itself, this in-falling gas can be stretched out and spun around to form a swirling disc about it, called an accretion disc. This dense, fast moving disc of material can emit over a very wide range of wavelengths, from radio to X-rays. 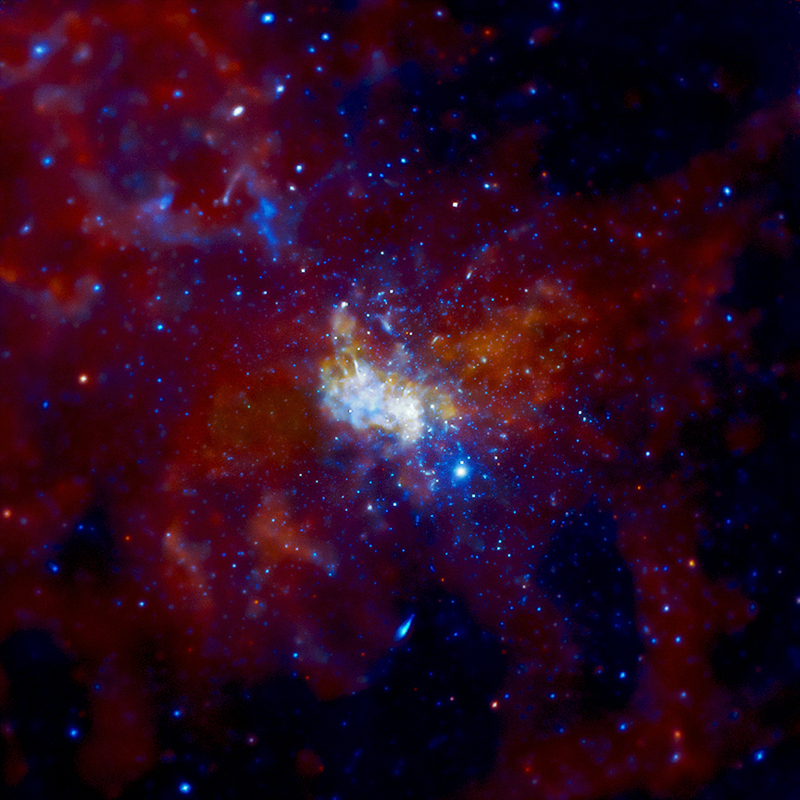 Sagittarius A* is a bright radio source and has been viewed using networks of radio telescopes on Earth. These observations have shown that the emission is coming from within a small volume of space, on the scale of the Solar System (which really is small, at least to astronomers). This might well be the signature of an accretion disc, but it is relatively faint compared to some other supermassive black hole candidates in other galaxies. This could quite simply be because our black hole isn’t consuming very much matter; it’s dieting. There are occasional, modest flares like the one seen by NuSTAR, so it could well be snacking now and then. Yet another way in which black holes can betray their presence is through jets of charged particles shooting out from the poles at nearly the speed of light. These particles, mostly protons and electrons, emit radio waves as they go – called synchrotron radiation. The exact process that produces these jets isn’t well known, but it may be due to the extreme electric and magnetic fields in the disc and/or the spin of the black hole supplying energy to these particles. These jets can be seen coming from the centres of many galaxies, like M87 pictured on the left, though not from our own Milky Way. In the case of Sagittarius A*, we can see the gas near the centre glowing in radio and X-rays. But there are also stars there too, and when their positions were tracked for the first time something amazing was seen. This animation was made using observations made by a group of astronomers, led by Dr. Reinhard Genzel at the Max Planck Institute. The data were taken over many years in the infrared part of the spectrum, which allowed them to peer through the dusty space which blocks the visible light coming from the galactic centre. If you study the centre of that animation carefully, you can see that the stars nearest the middle execute sharp slingshots around a conspicuously invisible object. Here is a more focused animation (and here yet more focused) where you can clearly see this motion. By carefully studying these orbits, and in particular that of the closest star — dubbed ‘S2’ — the mass of the central object was calculated using simple Keplerian mechanics. The answer: 4.31 ± 0.38 million times the mass of the Sun! What’s more, this huge mass has to lie within a volume only about 12 light-hours across; roughly the volume enclosed by the orbit of Pluto around the Sun. The presence of such a large mass in such a small volume, at the very region of space where we see the glowing Sagittarius A*, suggests that we do indeed have a supermassive black hole lurking at the centre of our Milky Way. † This may not strictly be true. So what about this gas cloud then? Over the last few years another object has been observed moving through this region of the galaxy, almost directly towards our slumbering behemoth, at around 1,700 km/s (3.8 million mph)… and it’s speeding up! A paper by Gillessen et al. outlines their observations of this cloud and they predict it will be stretched and ripped apart by the tidal forces near the black hole, allowing some of it to be devoured while the rest is thrown back out into orbit. If this happens, the gas should cause a bright flare as it adds to the accretion disc and ultimately falls inside. With telescopes all over the world (and above it) we will watch and wait to see whether this indeed happens. Our understanding of the enigmatic centre of our galaxy could be transformed by this rare event. Let’s hope so! How do you know when this is going to happen so I can find a telescope to see it in San Diego? Hi, unfortunately you won’t be able to see this with your eyes through an optical telescope, since the space between the Earth and the galactic centre is so full of dust and gas that the visible light is absorbed and scatterd. That’s why we have to look in the radio, infrared, ultra-violet and X-ray wavelengths to observe these events, since they are less scattered or absorbed than visible light. Judging by the measured motion of the gas cloud and its estimated distance from the central object, it’s expected to make closest approach in the middle of the year (maybe between 2 and 6 months from now), but we’ll have to wait and see for sure. The telescopes used to see the galactic centre in enough detail are either in space or networks of expensive radio telescopes on the ground. Those of us not directly involved in the research aren’t able to observe this kind of thing first-hand (and even those that do aren’t looking down an eye-piece, they’re looking at a computer screen). But we can keep track of what is seen via the agencies that run the telescopes, and the scientific papers that get published. I’ll definitely report back on any developments on this story that I find. I think the nearest big telescope site to San Diego is Palomar: http://www.astro.caltech.edu/palomar/ Looks like they’re open to the public most days, if you’re interested in visiting. But there’s an awful lot you *can* see through binoculars or a small telescope, so don’t let this one thing put you off. You can see planets, stellar nurseries and other galaxies quite easily if the sky is dark enough. You just need to get out of the city. Well that’s a very informative post. Looking up in the sky and exploring will be man’s greatest pastime in the future. I mean there is so much to see and learn. I have a small telescope myself and i spend hours in the night exploring the divine cosmos. And Yeah love the name of your blog. Hope to read more from you. Thanks for the kind words. I agree; for as long as we wish, there will be things out there for us to learn about and discover. April 25, 2013 - 9:33 pm S.C.
It’s a special thing for us humans, who live such short lives, to see cosmic events that occur on massive timescales. I look forward to learning about what people smarter than me figure out about the universe in a few months. Thanks! In this instance, we do seem to have struck it lucky! However, for things like supernovae we are now able to see so far out into the Universe (and so see a huge volume of space), so that by sheer force of numbers these relatively rare events are actually quite commonly observed and studied. That’s one of the great things about modern astronomy. A topic that has long been fascinating to me. I had no idea of this ‘forecast’, however, and I am excited to find out what it is that we will see. Black Holes have interested me because they are simply mind-boggling, but also because they have only ever been defined not by qualities within, but by qualities without, a sort of definition by negative isolation, which, as one who studied English, is a pretty cool physical manifestation of a bunch of otherwise overly-academic and (arguably)insignificant philosophies. Hi. I think I understand what you’re saying (I’m no student of English!). For me, black holes are so cool because the more you learn about them the more you realise you don’t quite understand them. Then again, inside them our understanding of the laws of physics fundamentally break down (and many greater minds have tried to remedy this) so I don’t feel too bad about it! I’m excited about what we might learn from this particular event too. I think any field of study where spaghettification is an accepted term in a theory probably has more uncertainty than not! That being said, I can think of no better word to describe the hypothetical situation. Thanks for checking out sciencesprings. I appreciate it vry much. Not at all. My next post will be about gravity, and in particular the white dwarf – neutron star system and testing general relativity which you blogged recently, so your post is a nice one-stop resource for me. Blogging as it should be; a two-way exchange. Thanks for stopping by. fascinating. the video was also a big help. Hi, thanks very much. The video credit goes to the European Space Agency, nothing to do with me. Found it after posting this though and thought I should include a link since it’s very well made. it was good of you to even search it through since it adds so beautifully to your post. thanks again. Very cool! I will have to keep an eye out for news about this when it happens. What a wonderful post. It’s the first of yours that I have read, and I’m going to start following you immediately! I read your post. You had me worried for a bit, but then it became clear you weren’t really insane after all! I agree completely, nice post. Science is a tool. Tools in and of themselves cannot be ‘good’ or ‘bad’. And we’ve gained much more knowledge from the tool of science than from any other method of learning to date. So while individuals can apply this knowledge for ‘bad’ things (driven by politics and/or monetary greed), we can also apply it for ‘good’ things like MRI scanners or communications tech. Thanks for reading. Yes, you’re absolutely right. I should have included something similar to your comment in my post; science itself is neutral but has been used to solve more problems than it has caused. Anyway, I’m going to have a lazy day and read more of your posts. Physically lazy, I mean, not intellectually! Space is so interesting, spins my head sometimes. Its amazing how we observe things playing out in front of us(millions of lightyears away)- but ‘playing’ is wrong isnt it, its already played out. I’m not sure it’s wrong at all, actually. Relativity shows us that the timing of events is not a fixed thing, it depends on the observer. Two events can happen at the same time accoridng to one person, but another person could see them happeneing at different times. Neither are wrong; both are right in their own way. So, as far a we are concerned, it’s perfectly correct to say this is all happeneing ‘now’. Well, technically yes. But when we talk of an effect millions of years after the cause, even though it is ‘now’ we ‘know’ it happened already. I understand, black holes are so enigmatic. They tempt us to ask more questions, which is never a bad thing. Thanks for reading. Great post! To me, it is incredible how our understanding of what we see “out there” – the planets, stars, galaxies and so forth – has been transformed in the last generation by our rise in tech capability – not just space observatories but improvements on our ground observatories etc. Allowing us to not only see but hypothesise and understand what we are seeing. Black holes are a case in point; when I was learning physics, they were theorised – an obvious outcome of the Einsteinian universe. I remember winning a high school science prize for a display I made based on the understanding back then. Now we’ve detected them; we even know how they’ll behave – have even applied quantum physics to particle behaviours on the event horizon. Wonderful, wonderful advances in our conceptualisation of how the universe works. For myself, I would never have dreamed that we might have done this – discovered such a dynamic, exciting, colourful (in wavelengths other than light’s mere octave) and just ‘cool’ universe out there, so different from what we imagined in the mid-twentieth century. Very interesting! Thank you for the post.